Comments: Breeding adults are distinctive with gray wings, white undertail and black head, neck and body. Juveniles and nonbreeding adults are gray across the wings and back and have gray underwings. The lower body is white. The white head has a dark crown and a dark spot behind the eyes. These small terns are semicolonial and nest in emergent vegetation in shallow, freshwater marshes across the northern U.S. and central Canada. They winter along both coasts of Central and South America. First year birds usually summer from the Gulf of Mexico south. 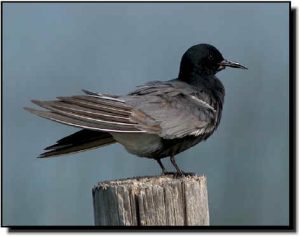 Black Terns eat small fish, insects and other invertebrates. They are unlikely to be mistaken for other species.